BE SURE TO CHECK OUR VIDEO TAB, FOUND ABOVE THE HOUSE PHOTO! NEW IN 2015: We have a new dining room table expanding the seating capacity to 10 (14 including the kitchen island), and new leather couches & lounge chairs in the living room. 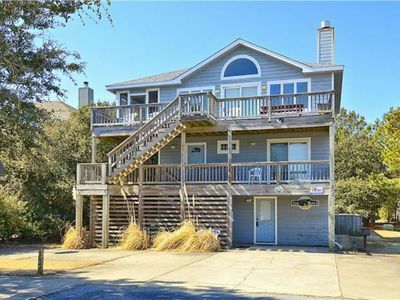 Wonderful home located on the most convenient, and quiet, Soundfront street in Corolla Light. Sunrise Sunset offers the lushness of the Soundside, while still being convenient to the beach. 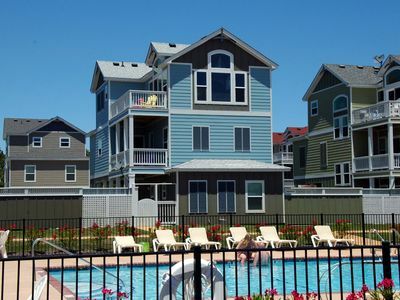 It is located directly across the street from the Indoor/Outdoor Sports Complex and only three blocks from the Oceanside Resort Complex & Beach, with access via a trolley which stops in front of our home every 30 to 40 minutes(Memorial Day to Labor Day). 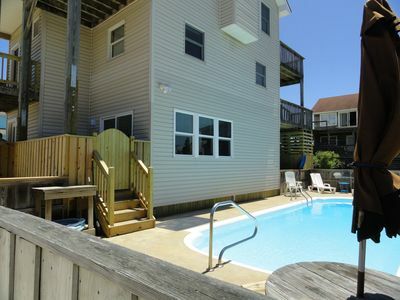 The soundfront outdoor community pool, including a toddler bathing area, plus pier and nature trail are located directly behind our home. In addition to enjoying your own private recreational amenities including private heated pool, hot tub, pinball, pool table, ping pong, air hockey and other games; you will have free access to the community recreation center which offers an Olympic-sized indoor pool, indoor racquetball & Walleyball, indoor and outdoor clay, hard surfaced and lighted tennis courts, and a fitness center with aerobics, weight & cardio rooms. 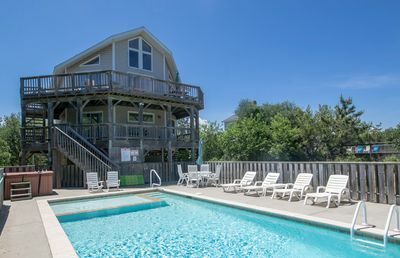 The Soundside is revered for its wonderful sunsets and after dusk you can lounge in the evening at one of the 2-patio dinette tables, on the porch swing or in the hammock. 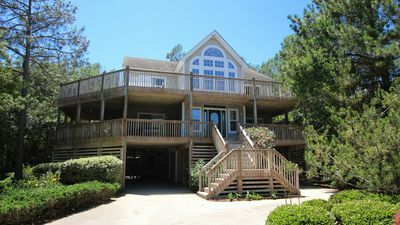 Alternately, retreat to the large great room which includes satellite TV, DVD, stereo receiver, desktop computer, gas fireplace and whirlpool jet tub in the top floor master bathroom. The kitchen is equipped with everything imagineable, including a GE Profile double oven and 2-exceptionally quiet dishwashers. 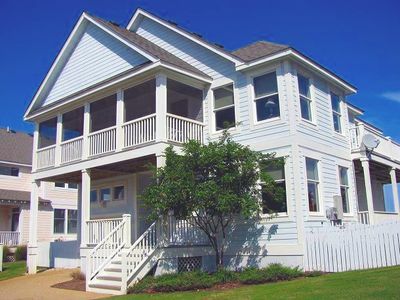 4-bedrooms with king sized beds, 1-bedroom with twin beds, 1-bedroom with a Duobunk and Trundle bed (sleeps 4) and 1-queen sleep sofa. All beds are provided with plush mattress pads, extra blankets and hypoalergenic feather pillows. Every bedroom has its own bath featuring exquisite tile work and a TV/DVD. Wireless internet and free long distance (US & International) phone service is available at no additional cost. 12 wrist bands provided for entry into the Corolla Light Resort amenities. It is up to each individual renter to determine how many can sleep in this home based upon the bedding provided. 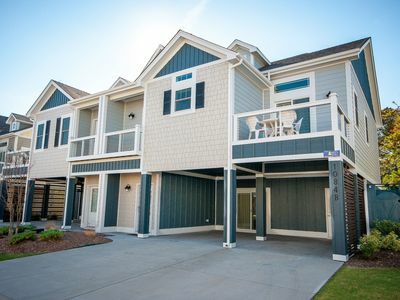 In all, we feel that our home offers every amenity a family could desire for relaxation and fun. Pool can be heated 4/30/2016 to 5/21/2016 and 9/17/2016 to 10/8/2016. Bed linens, bath and kitchen dish towels provided. 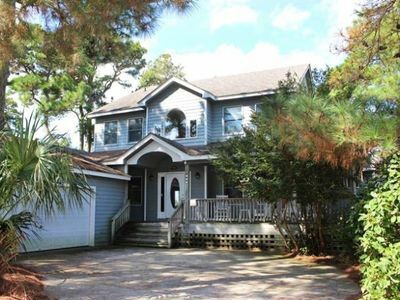 Locally managed by Brindley Beach Vacations, Sunrise Sunset - HOME REFERENCE NUMBER 549. Early entry beginning at noon on arrival day. DON'T WAIT TO START YOUR HOLIDAY! 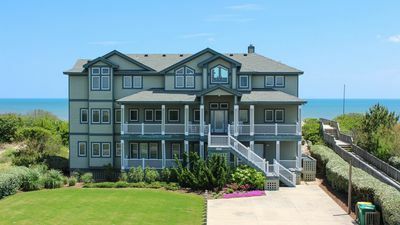 Corolla Light Resort offers discounted rates at the following golf courses: The Carolina Club, Kilmarlic Golf Club, Pointe Golf Club, Seascape Golf Club and The Currituck Club. Additional $100 Pet Fee applies if you wish to bring a dog. Owner welcomes calls to answer any of your questions! 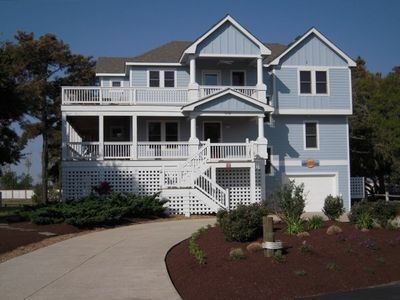 Oceanside Serenity At The Outer Banks...Serenity Now! 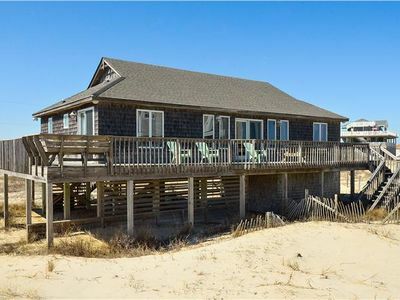 Sea Blessing - just 85 yards to the beach! 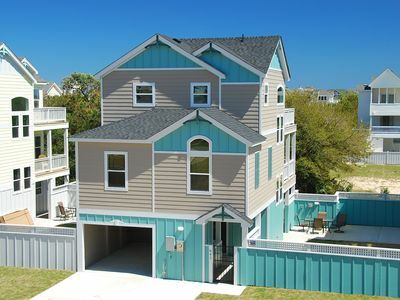 Villas At Corolla Bay - Brand New 4 Bedroom! Beat The Traffic With Flexstay! C0268 Keepsake. 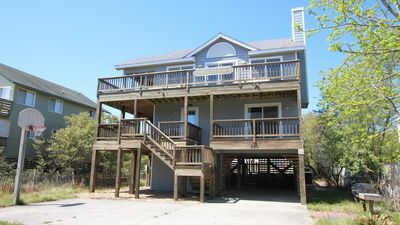 Private Pool w/Kiddie Pool, Hot Tub, Pets OK, Well Equipped!